Apple may have only one store in China  in Beijing, with a Shanghai store set to open this summer  but shanzhai iPhones have been a fixture in the country's bustling electronics markets for years. One of the earliest models, the HiPhone, which sold for as little as $100, had its share of problems, such as faulty construction and malfunctioning apps. "It's called the HiPhone, I think, because you'd have to be high to actually buy it," Wired associate editor Daniel Dumas wrote in an online review in December 2008. 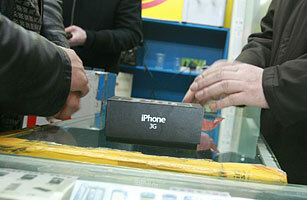 But iPhone clones have gotten better since then, with some startling innovations. The APhone A6, released last November, uses an iPhone interface to run Google's Android operating system. Next up is a 4G iPhone clone  expect a solid copy on the streets of Shanghai any day now. Watch TIME's video "Is the iPhone 4 Worth the Upgrade?"